What’s the Status of The Legend of Conan? Arnold Schwarzenegger is already back in the acting game after his long political career. He’s already starred in The Last Stand earlier this year and will appear with Sylvester Stallone in Escape Plan this October. The one film we continue to hear about that he wants to make is a sequel to the original Conan the Barbarian titled The Legend of Conan, an appropriate film for the actor given that he’s celebrating his 66th birthday today. TheArnoldFans.com spoke with Fredrik Malmberg, the CEO of Paradox Entertainment (the rights holders for “Conan”), and got a few more details about the film. 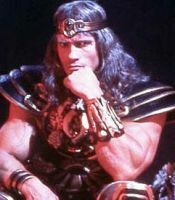 The site then asked Malmberg if the sequel, currently in development with the writers of The Fast and the Furious franchise, would go the route of Indiana Jones and the Kingdom of the Crystal Skull and bring on a “young, hip” son for Conan. Malmberg also said the studio is mulling over the possibility of shooting the film in 3D and this story shall also be told. Schwarzenegger is also set to appear in the upcoming horror film Maggie and may be back in the Terminator reboot. The Legend of Conan is said to be a direct sequel to 1984’s Conan the Barbarian and will ignore the events of both Conan the Destroyer and of the most recent reboot, 2011’s Conan the Barbarian, which features “Game of Thrones” star Jason Momoa in the lead. Universal is aiming for a 2014 release.